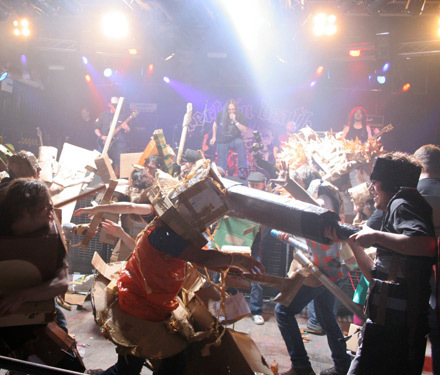 Baltic Boxwars: Northern League is a networking project with the ambition to make a 2-day workshop & performance events, which bring together 'cardboard-clad' warriors across North-Eastern Europe. Supported by Taidekoulu MAA. Workshop is free and open access to non-students. Attendance can be 1 or 2 days, depending on ambition and time. It will be possible to make cardboard armour & weapons anytime from midday 13th until evening of 14th. Some cardboard, tape and tools will be supplied.. But to be sure, get prepared and bring your own. See below for further information about genre. NB/ Please state your name, organisation-or-affiliation, contact details (email + mobile) & which workshop day(s) you want to come. Please forward this call to those who you believe are ready to take up cardboard arms! Pixelache 2008 Helsinki features the first edition of 'Baltic Boxwars: Northern League', initiated by Andrew Gryf Paterson in collaboration with Demian Deadly & Tamsyn Pop Tart of Boxwars UK ; co-produced with Pixelache club organiser Antti Ahonen. Supported by Taidekoulu MAA.